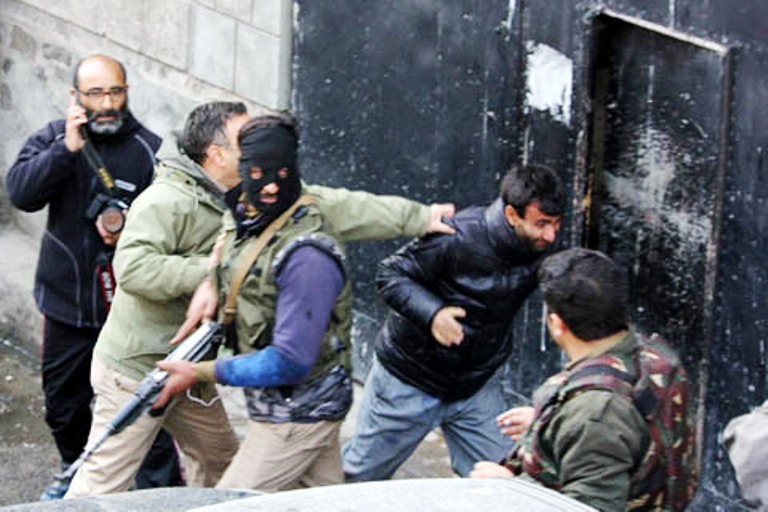 Kashmir Editors Guild (KEG) has strongly condemned the manhandling of various reporters and videographers by policemen in Fatehkadal locality of Srinagar where they had gone to fulfil a professional obligation. Two militants, a civilian and a policeman were killed in the locality in an overnight gun battle. The house in which the encounter took place was on fire and they were covering the incident. At the time of the police’s illegal attack on media, there was no gun battle, no protest and the only activity was the firefighters were extinguishing the fire from spreading around. “Today’s incident is yet again a grim reminder of the fact that how vulnerable the press core is in an area that is riddled with conflict and lawlessness,” KEG said in a statement. “The crisis, however, is that the beating of journalists by police and paramilitary men is becoming a routine now and this state of affairs is an impediment in helping institutions deliver their professional duties. In today’s incident, a senior police officer was watching as his subordinates were beating the journalists,” said KEG. KEG while strongly condemning the incident calls for a strong action against those who were involved in the act.